For some reason I’ve been getting a ton of EPs lately. Some, I’m thankful they’re not full length, but for the most part I wish they were longer. I am happy to report that Coles Whalen’s EP is one of these. “Why I Cry” is one of those break up songs that hits home to those of us who have lost someone to another person. It’s quite personal and sad (and she’s a little pissed off). It’s also quite catchy and will stick in your head for hours, maybe days. This is a great recording, I really like it. 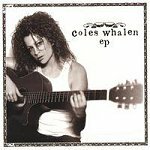 I’m looking forward to a full-length CD from Coles Whalen. Stand out songs: “Pick up the Pieces”, “Sevens” oh hell I’ll name them all. Not a bad one in the bunch.